As the name suggests, this is one heavy duty mamma! 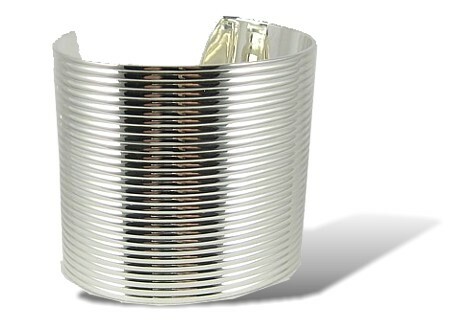 Created solely in 925 Sterling Silver this absolutely fabulous Cuff weighs from 110grams - no small feat when you consider that most heavyweight bangles are struggling to tip the scales at 70g. Totally sensational in every way from the dramatic, mesmerising parallel lines design to the sheer quality and quantity of the silver, the Heavy Metal Cuff is totally attention-grabbing and designed to last a lifetime! Not for the limp-wristed!